Mary Barra who is now the CEO of General Motors, defined the dress code of GM in two words when she became Vice President of Human Resources in 2009, months after the company filed for bankruptcy. And so the 10 page (yes 10 pages!) 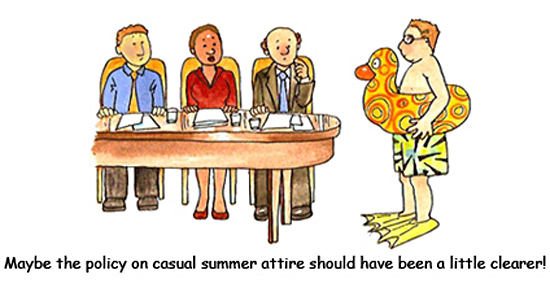 dress code policy became two words ….and two very sensible words at that! 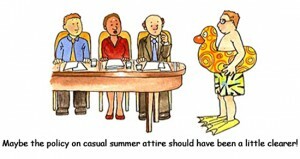 Clearly if you work on the factory floor at GM your dress code is different to a colleague in marketing. As the world of work changes, boundaries become blurred, life becomes more flexible, then so our wardrobes should too, often depending on what’s in the diary for that day. We can all keep a jacket on a hanger and a different pair of shoes under our desk for when the need arises, but as with many things in life, trusting people to make the right choices is more effective than imposing “the rules”!